Who knew one thing could instantly change the look of my family room? Who knew one thing could instantly change the look of my family room? Who knew one thing could instantly change the look of my family room? Crazy how one thing can instantly change the entire look of a space. As you know, I’ve been working on a bit of a family room refresh and the biggest offender in this space was definitely our area rug. We held onto it for so long because a large area rug can be really expensive. But I figured out an easy way to get an equally large (and way more fun) area rug in here on a budget. So today it is out with the old, and in with the new. Let’s take a minute to remember the old rug. Good-bye old brown-worn-out-stinky rug. You took it like a champ and held on to dog dander and milk spills like a champ. Kept my kids from hitting the hard floor more than once and for that I thank you. When I saw this rug online I knew it was perfect and it set the stage for this family room refresh. The colors would fit into what I already had going on in the space, but add a ton of personality and a few more colors, which is exactly what this room needed. I want this space to feel way more casual and fun. The problem was that this room needs a pretty large area rug and it was difficult to find one that fit my space nicely and didn’t cost thousands of dollars. So I did what any budget minded decorator would do and figured out how to get the look I wanted for less money! Since you can find such good deals on smaller rugs online, I got three 5 x 8 rugs and joined them together to create one large area rug and because of the way the pattern goes, you can’t even tell unless you look really close. Joining the area rugs together to make one large rug was so incredibly easy. All you need is your rugs and single sided carpet tape. 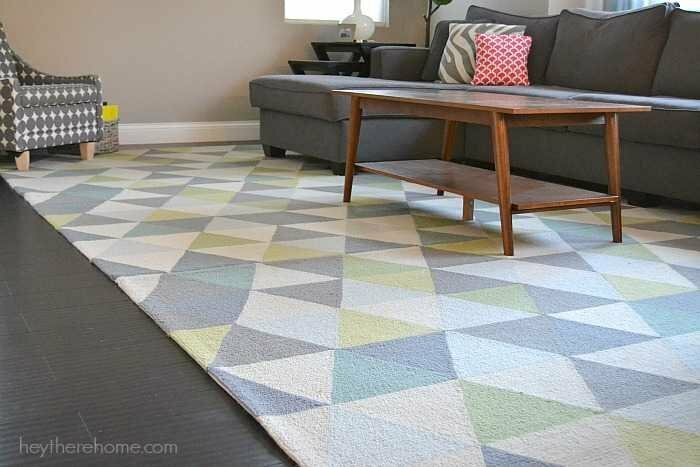 Step 1: Lay your rugs out and make sure that the pattern lines up the way you want it to. Pull up the corners of each rug where there will be a seam and mark the same number on each of the rugs so that when you flip them over you will know which corners go together. 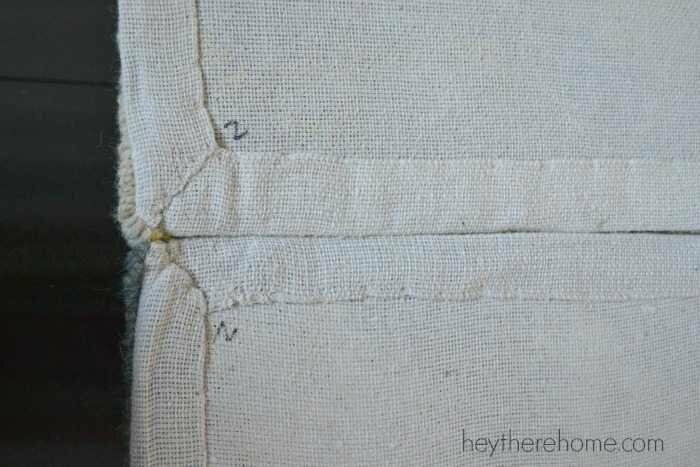 Step 2: Flip your rugs over and line them up according to the numbers you marked. Place them as close together as possible making sure that the carpet part stays below the seam. 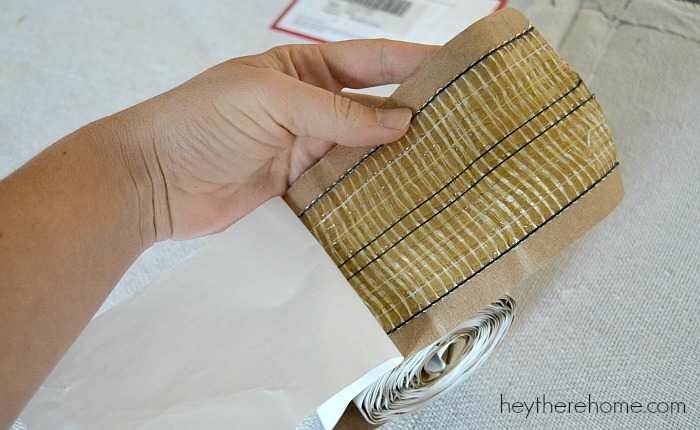 Step 3: Using single sided carpet tape, tape the seams together and press firmly. You will want to make sure that you use single sided carpet tape because you only want the side that is joining the rugs to be sticky. 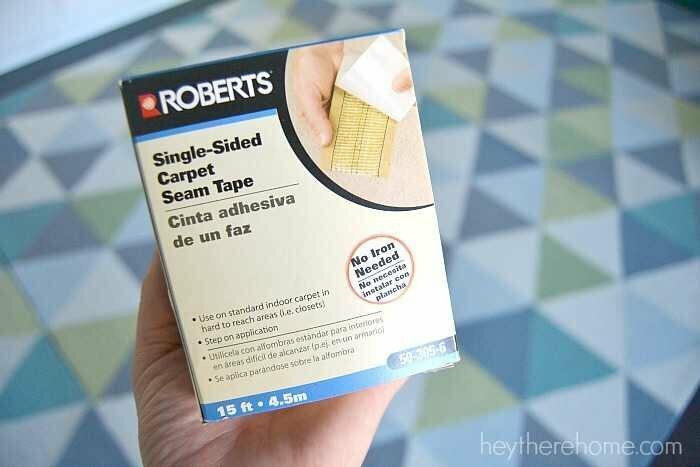 It’s really easy to use, you just peel off the paper as you attach it to the seam. Step 4: Flip your rug back over! Now I have an area rug that is big enough for my family room! 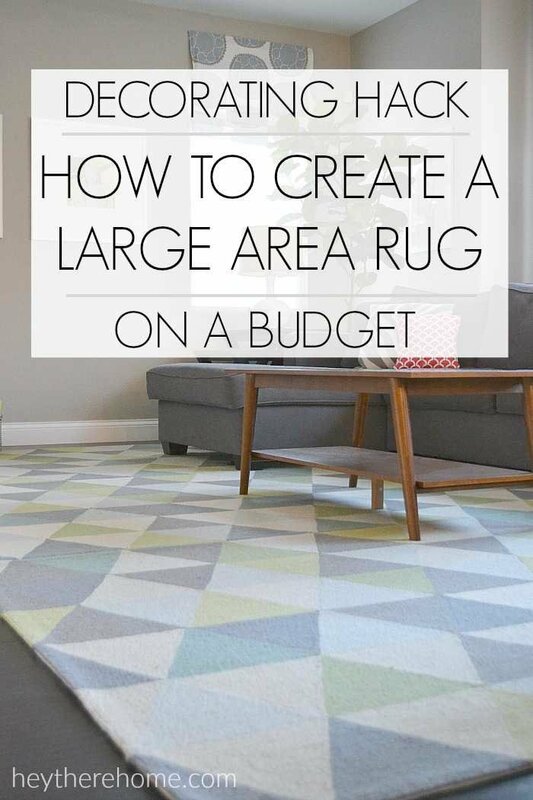 Rugs don’t even come in this size, so it is as close to custom as you can get without breaking the bank! And the color and pattern it adds to this room is soooo good! Ok. I just have a few more things to add to this room to finish the refresh! It will most likely have to wait until the very beginning of January though, cause Christmas is about to take over in here! PIN BEFORE YOU GO! Just hover over the image below. DIY Drum Shade with My Own Fabric! So is the total size 15 x 8 ? Thanks for asking Cristin! The 3 rugs total 15 x 24 (5 x8 each). I Love your simple hacks, I just had to come back and read this again! Quick Q though,how do you clean your rug? Apart from vaccuming,i like to get mine out every 2 months and scrub it well with water and soap(i have a toddler and the spills are inevitable 🙂 )-am just wondering if you have tried cleaning yours and was it easy to do? Or does it get complicated due to the fact that you have used tape? Great question, Lois! My rug is wool so cleaning it is complicated in general. I did take it outside to clean it once and just removed the tape and redid the tape when I brought it back in since it’s so easy to do. But generally vacuuming it does the job for us. 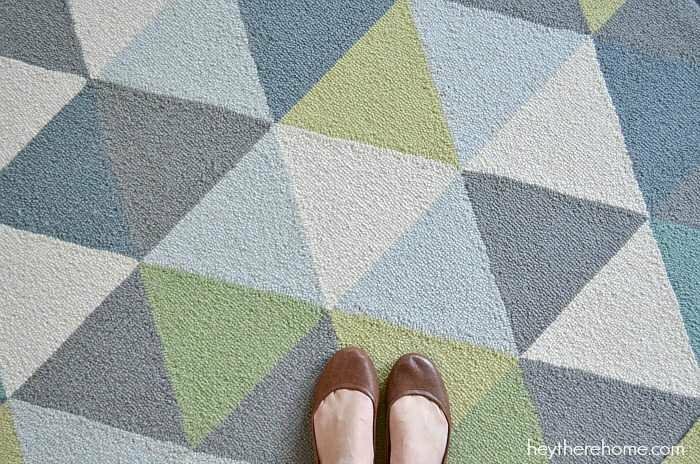 Do you know the name of the rug? The links are no longer active and I was just curious if I could find the rug elsewhere online. Thanks! Hi Jodi. Sorry about that. Here is the link to the rug. What do you think of the striped curtains with the rug(s)? 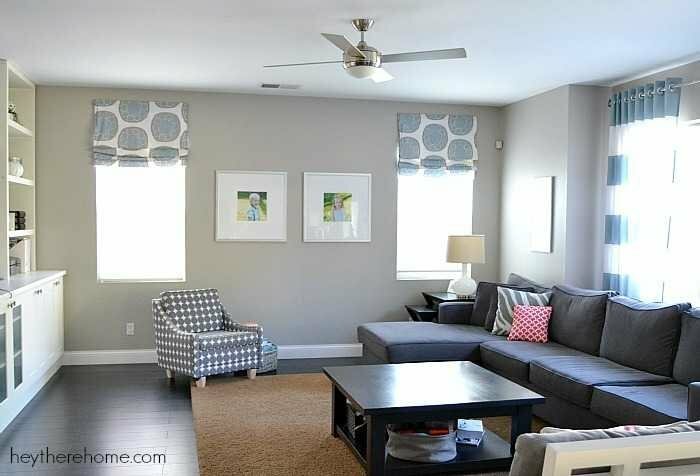 I just bought this same rug in 8×10 and I’m looking to buy curtains. I’m likely going to wimp out and get solids. Hello. I love my striped curtains with this new rug. The blue plays off of it perfectly. If you go with solids though, jut be sure to use some more pattern in your pillows so that you have added interest. By the way, the rug sheds a bit at first, but don’t worry it gets better. It says the tape is temporary. I would be interested to know how well its holding up/together? Hi Laura. Where did you read that it is temporary? It is holding up really well with 2 young kids that play all over the rug all day long. It looks like a great idea and I’m going to send this to my kids for their houses. Great trick! This is such a bright and cheery room … love it! So smart and I love the pop of color that rug(s) bring!! LOVE this idea! I never would have thought to do this! Oh my!! This is such a great tip!! Definitely saving for future reference! !